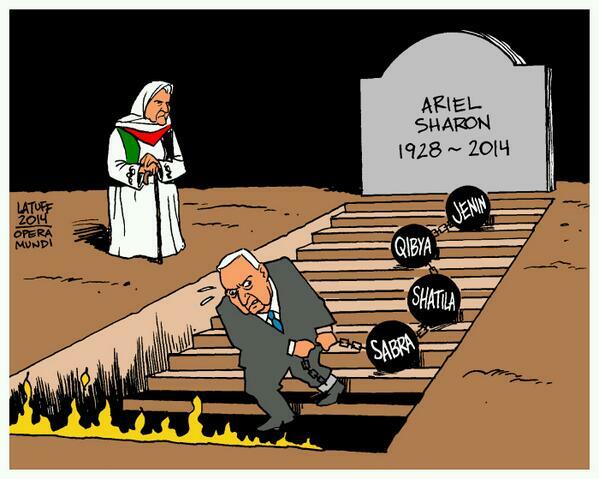 Sharon was a war criminal, a key leader throughout the Zionist genocide of Palestine. 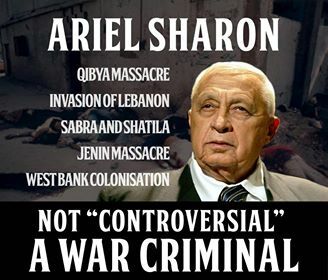 The bourgeois media pretends that there is nothing extraordinary or unusual about the everyday injustices that makeup the genocide of Palestine. Sadly, the media is correct. The bourgeois world is such that the genocide of a whole people can slip under the radar with only a little noise coming from a stone thrown by an Arab youth against a tank or a DIY missile flying overhead that can barely do any damage if it can even hold together during its flight. This the media spins into a terrorist menace used to justify the much greater imperialist responses from their multimillion tanks and missiles shot at mostly defenseless Arabs, wiping out whole families and villages. And, in the First World, only a few college students and far-left types can muster the energy to care. For almost everyone else in the First World simply accepts the imperialist line: Israel is good, the Palestinians bad.